← Monday 4th May 2015 – Just a quickie!! Lottie and Dottie Sow Sunflowers!! I’m sure you’re all fed up with hearing about the election!! Well I’m here to let you know that there is something even more exciting happening today!!! 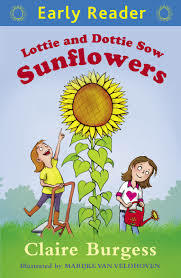 Lottie and Dottie Sow Sunflowers” is published TODAY!!!! I’m so excited, and it looks like everyone else is as well, because it seems to be sold out on lots of online retailers. It’s clearly very popular. You can order your copy and it will arrive, here are some links for you. Amazon, Waterstone’s, Book Depository, I’m sure there are more, but I just can’t think of them at the moment. They clearly didn’t order enough copies to meet demand. Hope you are able to get a copy, and really enjoy it. I hope you also have a go at growing a sunflower this year, there are loads of varieties to choose from. If you do, let me know how tall it gets, and a photo would be great as well. Happy gardening!! See how tall yours will grow!! This entry was posted in Uncategorized and tagged amazon, Book Depository, claire's allotment, Lottie and Dottie sow Sunflowers, Waterstone's. Bookmark the permalink. 2 Responses to Lottie and Dottie Sow Sunflowers!! Congratulations on your book! Good luck with it, sounds like it’s going to be a sell out. Claire, I am new to your blog and looking forward to following. I wonder if I can ask for some help? I’m growing veg for the first time this year, and think I’ve just made a big blunder with my first sowing of broad beans, (I’ve sown them in pots and they are still indoors.) I read about pinching the tips out, but failed to notice that I should have done this when the beans start to appear on the plant, which they haven’t. These plants are about 3 – 4 inches tall, with two enormous leggy ones at nearly 8 inches. They are Suttons – have I just ruined their chances? Many thanks, (sorry for long post), Kate. Dear Kate, Broad Beans are a great vegetable to start off with. This is what I do: Sow in 3 inch pots in the greenhouse. When they are about 4 inches tall then transplant them outside positioning 9 inches apart. They shouldn’t need staking, but if they are a big leggy, then by all means do until they’re more robust. You don’t have to nip out the tops, but they do attract the aphids. If you do want to nip out the tops, then wait until the flowers have gone otherwise you may nip them off instead. If you do get aphids then spray with a little diluted washing up liquid. Hope this helps. Have fun.